Accent your kitchen by adding this stylish yet durable Vigo faucet. Stainless steel finishes with matching soap dispenser all solid brass construction which ensures durability and longer life. Faucet features dual pull-out spray head for aerated flow or powerful spray. Includes a spray face that resists mineral buildup and is easy-to-clean. Stainless Steel Pull-Out Spray Kitchen Faucet with Soap Dispenser Accent your kitchen by adding this stylish yet durable Vigo faucet. Stainless steel finishes with matching soap dispenser all solid brass construction which ensures durability and longer life. Faucet features dual pull-out spray head for aerated flow or powerful spray. Includes a spray face that resists mineral buildup and is easy-to-clean. Stainless Steel Pull-Out Spray Kitchen Faucet with Soap Dispenser is rated 4.4 out of 5 by 73. Rated 5 out of 5 by dzjac from Nice design, solid construction. I bought this unit with soap dispenser a month ago, and I am happy I did. Since my sink have 5 holes I had to purchase deck plate separately (it is expensive comparing with the entire faucet cost). Also, Vigo does not have sink hole plugs, I had to purchase it from different manufacturer to cover the 5th hole. This unit is very well designed with all metal construction, including pull out sprayer (unusual in this price range). Installation was simple and straight forward. All parts were included in the box. It took me about 3 hrs to remove the old unit, but only 30 min to install the new one . The handle/valve arm and pull out sprayer works very smoothly. One thing I am missing that I had on old faucet: I would like to see pull out sprayer be equipped with a small 360 deg swivel type aerators - that is very convenient and easy way of flushing/cleaning small debris from the sink vs the whole sprayer handle removal. The faucet and the dispenser looks fantastic, and I hope they will last for long time. Rated 5 out of 5 by Bryan Pinky from Great decision! We were installing a new granite countertop and so it was necessary to upgrade our faucet. I researched the many options and read countless reviews before deciding on Vigo. I’d never heard of it but just so happens the granite dealer sold this brand. But we found it much cheaper online and ordered it. The thing I noticed was that it was heavier and seemed sturdier than others I looked at and handled. Love the soap dispenser and it works great! Overall I am very happy and satisfied with the purchase. I’ll recommend it to others! Rated 1 out of 5 by ALEXANDER from Pressure is not stable This is the second time this type of faucet has been installed, but a year later pressure is dropping again. 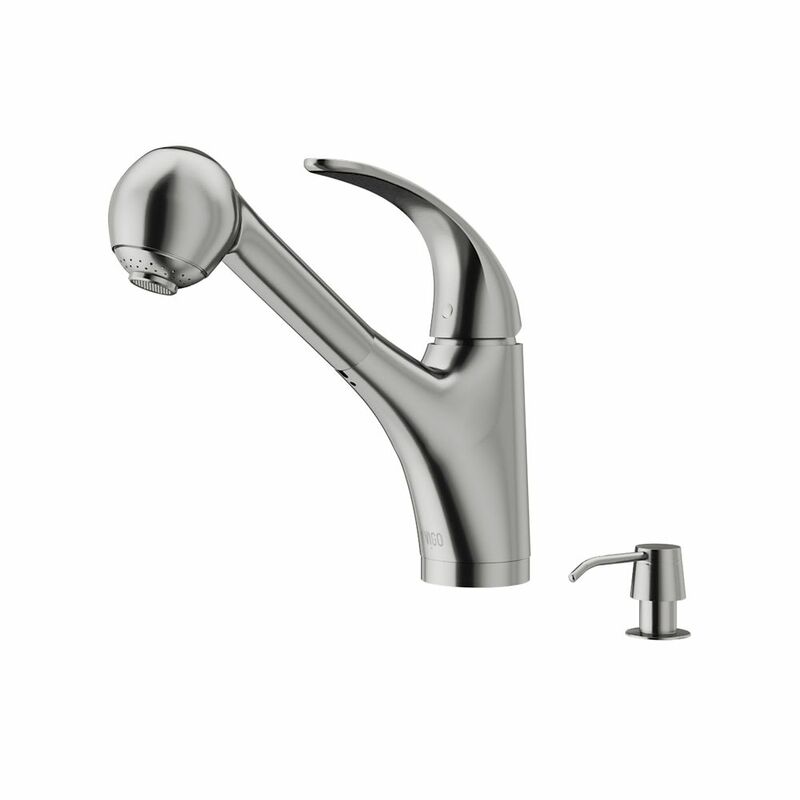 Rated 3 out of 5 by ElBo from Some issues, but functional and attractive Beautiful faucet. Installation was difficult, though, and the weight has a tendency to get caught on the pipes when using the pull-out feature. This might be due to the design of the plumbing rather than the fixture itself, though. Also, sometimes the water pressure seems low even when the rest of the water pressure in the house is fine. Overall, satisfied, but would probably buy a higher quality faucet if I had to do it again. I believe the brand is a good one. Rated 1 out of 5 by ElaineB from Good look and functionality for a faucet. We really like the look of the brushed stainless steel faucet. Also it is a nice size compared to some which are too high and obstruct a view if your sink is in front of a window as in a lot of kitchens. One of the best features is the long extension for the faucet to reach to fill a pot on the counter or stove. We had it installed for a few months and are pleased with the features. Rated 2 out of 5 by Disappointed from Water Flow Problem When the plumber installed this faucet he worked for half an hour to try to get a reasonable water pressure level without success. I called VIGO and was told to remove the restrictor. Had plumber back and after removing restrictor there really wasn’t much of a difference. Facuet still had very low pressure and the pressure is not consistent. Plumber installs many brands and said he hasn’t run into this issue before. It isn’t 1/4 the flow I had with the faucet I replaced. Can’t believe anyone can live with water pressure at this level, dish soap doesn’t even suds up. If anyone has a solution other than replacing the faucet please let me know. Love the look of the faucet and appears to be well built. Rated 5 out of 5 by 9dimes from The wife digs it! I installed it and the soap dispenser a month ago and both seem to be high quality, sturdy and working fine.